Slip into a pair of overalls and try your hand at running a farm! 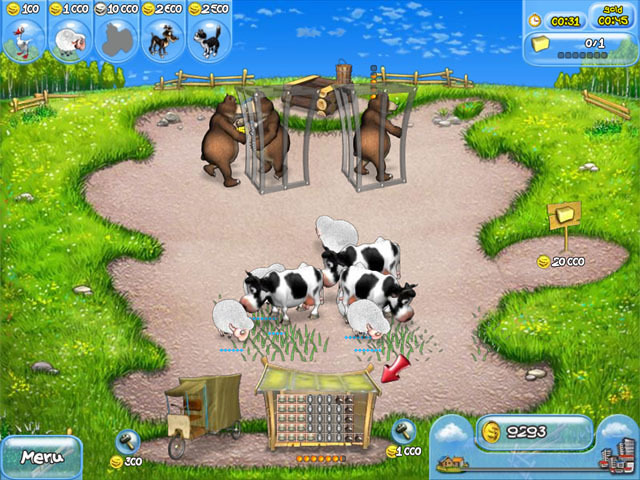 From tending to the fields where your cows graze to gathering eggs for sale at the town market, Farm Frenzy 1 is as stimulating as the real thing, only you won't have to experience the nasty smells! You will, however, be required to invest the money you earn in new equipment. Building a cheese dairy, for example, allows you to process your milk on the spot and make even more cash! Slip into a pair of overalls and try your hand at running a farm! ...... a certain number of eggs. Each new level is more challenging than the last, so you must increase the capacity of your warehouse and improve the performance of your production facilities. You can even buy a larger truck capable of delivering more goods to market! All of this makes dealing with the occasional bear easier. Featuring compelling and enjoyable gameplay, Farm Frenzy lets you give Old MacDonald a run for the money! * Full technical and customer support. Is an extremely dynamic game. Farming has never been this funky! Is a fun and addictive puzzle game in the spirit of Snood or Bust-A-Move! It's survival of the biggest in this action packed deep-sea challenge. A fun puzzle game reminiscent of Snood. Hilarious online word game where you create acros and vote for your favorite. Careless domestic animals live in 3D Happy Farm screensaver. Qweas is providing links to Farm Frenzy 1 2011 as a courtesy, and makes no representations regarding Farm Frenzy 1 or any other applications or any information related thereto. Any questions, complaints or claims regarding this application Farm Frenzy 1 2011 must be directed to the appropriate software vendor. You may click the publisher link of Farm Frenzy 1 on the top of this page to get more details about the vendor.